The GRE (Graduate Records Examination) is a test designed to supplement the information that admissions officers receive when you apply to graduate programs. The GRE has three distinct section types, distributed over six independent timed sections, two of each type. There are two essays, each with its own focus. The Analysis of an Argument asks you to write a logical analysis of a text. The Analysis of an Issue requires that you choose and defend a point of view with logical arguments and support. You are given 30 minutes to write each essay. The quantitative part of the exam is composed of two independent 35-minute sections with 20 questions each. Math concepts are not specific to any field. Topics covered include arithmetic, percent and fractions, algebra, geometry, statistics, and number properties. The questions are asked in a number of formats. There are two 30-minute verbal sections, consisting of 20 questions each. The questions these sections focus heavily on vocabulary and reading comprehension, with a few logic-based reasoning questions mixed in. The GRE General Test is required by many graduate/masters programs as part of their admissions processes, and many MBA programs now accept it as an alternative to the GMAT. Check the application requirements of the schools you are applying to. 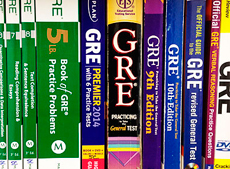 The number of schools that accept or require the GRE is in the thousands. You should definitely prepare for it, whether you choose to study on your own or take a course. The GRE is a very broad exam, and a number of different skills are tested. It is essential that you be familiar with the exam before you take it. You may not need to take a course to get the score you need, but taking this course has a series of advantages. The course provides a complete review of the exam, focusing on each section through theory as well as sample questions. Additionally, I have a degree in secondary education and have been preparing students for the GRE exam for nearly twenty years, so I am thoroughly acquainted with the GRE. Classes are reduced in size so students get a lot of personal attention. Finally, the course offers five hours of one-to-one tutoring, apart from the regular group classes. These hours can be used to review exercises or clear up doubts as well as to refine your test-taking strategies.